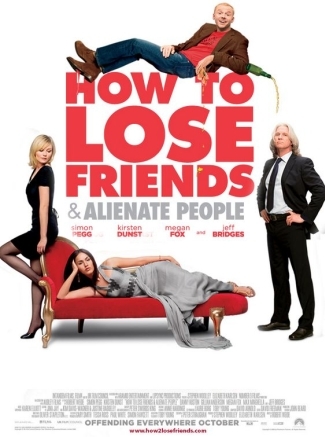 How To Lose Friends and Alienate People (UK, 2008) | The Cineaste's Lament. Here’s just a few that rush immediately to mind: Does the world really need yet another roman a clef about life at a magazine in the vast Conde Nast media empire (see “The Devil Wears Prada” and “Bright Lights, Big City.”)? Has a movie yet been made that tests Megan Fox’s gifts as an actress? Does the presence of Jeff Bridges in a film lift its classiness by an order of magnitude? And why is Kirsten Dunst, who brings a lemondade-y beauty to every role, so criminally underused as an actress? The answers, as near as I can figure are these: 1. Yes, sorta. 2. Not so far. 3. Absolutely. 4. I have no idea. To be sure, there’s nothing new under the sun about the plot of this film: Young buck comes to the big city hoping to make his mark. After initial flailing attempts, he makes it to the inside, only realizing that it little profits a man if he gains the whole world only to lose his soul, and redemption comes from the beautiful girl who was there under his nose the whole time. Music swells. End credits. Fade to black. In this version, Pegg plays British journalist Sidney Young, a brash ne’er do well who edits a rag called “Postmodern Weekly.” After making something of a splash, he’s snatched up and spirited away to America to work for “Sharps” magazine, a glossy monthly edited by Clayton Harding (Bridges), who sees echoes of his younger self in Sidney. This is where the roman a clef bit comes in: Pegg’s character is the fictional doppelganger of actual British journalist Toby Young, whose disastrous tenture as a reporter for real-life glossy Vanity Fair, memorialized in a book of the same name, serves as the source material for the film. Pegg, a gifted comedic actor, brings the same affable cluelessness he brought to earlier roles (“Shaun of the Dead,” “Hot Fuzz“). In his hands, Toby strives to be an iconoclastic and hard-charging journalist in the mold of Hunter S. Thompson in a magazine filled with fawning show-ponies. His utter failure to fit in only makes his efforts that much more touching — and hilarious. Avid media-watchers will also recognize Bridges as the fictional doppelganger of real-life Vanity Fair editor Graydon Carter, a Canadian who made his name in the 1980s as the editor of the bitingly satirical (and sadly departed) Spy magazine. “How to Lose Friends,” functions best when it ignores the rom-com subplot between Pegg’s character and a Sharps sub-editor named Alison Olsen (Dunst) and sticks with the meta-commentary about the celebrity-industrial complex and the legions of magazines that perpetuate its myth. The look of disgust that crosses Sidney’s face when a power-publicist (Anderson) that she’ll need photo and copy approval is just classic — and ought to resonate with any reporter who’s ever had to explain the basic precepts of the First Amendment to a source. At this early stage, he imagines himself above the sycophantic profiles that are the stock-in-trade of celebrity rags. Of course, we know, it’s inevitable he’ll sell out by the tail-end of the films’s second act. Fox, who remains as wet-lipped and stunning as ever, essentially plays herself as Sophie Maes. She’s a well, a wet-lipped and stunning aspiring actress of dubious gifts, built-up by the very same celeb-industrial complex, so that her inept starring role in a biopic of Mother Teresa — of all people — lands her what appears to be a Golden Globe nomination for best actress. The fictional trailer for the fictional film is laugh-out-loud funny in its purposeful awfulness. Seeing Fox in this role now, with the baggage attached to her real-life career, makes one wonder if she’ll ever be handed a part that does not involve her playing the obligatory hottie who’s either running from giant robots or toying with men’s hearts. As Sophie Maes, she’s not particularly required to stretch herself as an actress. Bridges brings curmudgeonly humor to his role as Sharps’ editor-in-chief. Sporting extensions that mirror Graydon Carter’s own leonine mane, he steals just about every scene he’s in, including a hilarious segement where he admonishes Toby, fresh off a disastrous interview with a Broadway star, to never ask musical-theater actors if they’re Jewish or gay. “Just assume they’re Jewish and gay,” he grumbles, and it’s hard not to mistake the glee he brings to the role. Dunst isn’t given nearly enough to do as the sub-editor who serves as Toby’s initially reluctant guide through the halls of the magazine. But you just know they’ll be in love by the end of the film. And, sure enough, they are. Someone really needs to develop a starring vehicle for her. This entry was posted in comedy, Our Films, rom-com, roman a clef. Bookmark the permalink.